Join us at Middlesex University for the exciting launch of London Centre for SME Development – a new joint venture from NLCCE and Middlesex University. Find out about the benefits of joining including the chance to become part of a dynamic business community with opportunities to network, share knowledge and grow through events, thought leadership and access to the significant resources of the University (including access to employable graduates and interns). 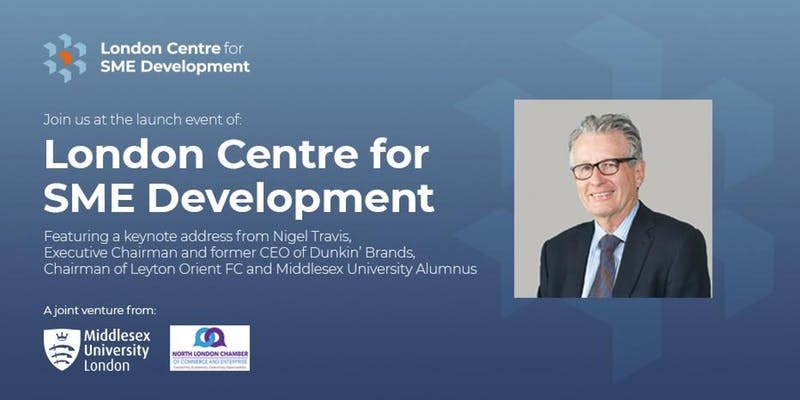 We are delighted to welcome at the Launch event our keynote speaker, Nigel Travis, Executive Chairman and former CEO of the massive American company, Dunkin’ Brands. He also Chairman of Leyton Orient Football Club and author of, “The Challenge Culture: Why the Most Successful Organisations Run on Pushback”. Nigel will share some of his experiences and insights with us, this talk will be followed by a moderated Q&A session. Drinks and canapés will be served throughout the evening.